Photographing a speeding locomotive from the tracks in front of it is dangerous business; too dangerous for me. So, how did I make this photograph? 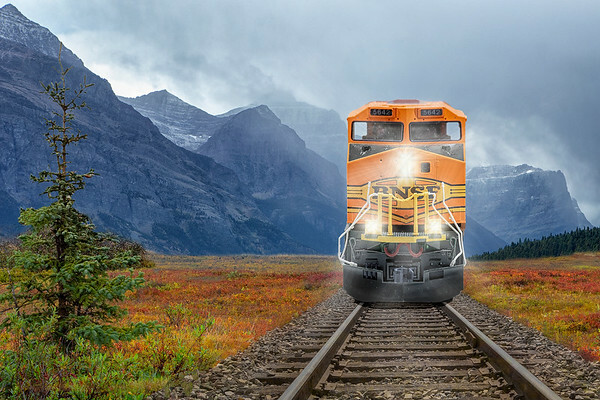 While, not simple, I created a composite using an image of the mountains I had made in Glacier National Park, another with colorful foliage in Alaska, railroad tracks that I photographed in Granger, Texas and a locomotive I photographed in my kitchen. That’s right, I photographed it in my kitchen. You see, my friend Jim Doe creates remarkable models of all kinds of things and he let me use his BNSF locomotive. It is so lifelike that no one would know it isn’t the real thing. I loaded all those images into Photoshop along with an image I made at a Civil War re-enactment for the engineer and went to work. This composite was the result. Who would think that the train in this photo is a model? I don’t know. It looks real to me and creating this image was completely safe.